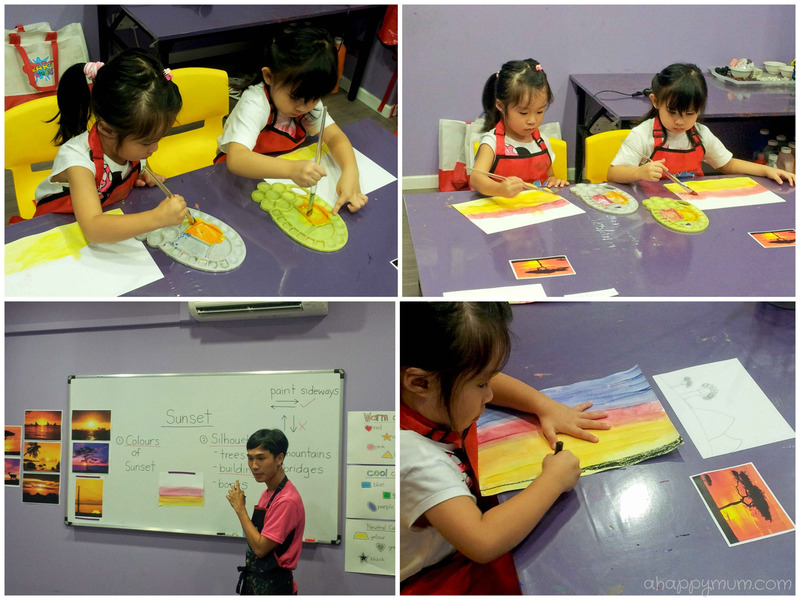 needed to scaffold their foundation and develop their skills to create interesting artworks." As a stay-at-home mum to three boys previously, Rena has discovered that motherhood comprises of days which can be hectic but at the same time be brimming with fun and love. Having a strong passion for children, she is also concerned about their development and therefore other than academic areas, she takes effort to notice their interest in other fields. When her eldest son displayed a love for art, she did her part as a supportive parent by sending him to an art studio for two years. However, her sharp motherly instinct made her realise that the classes had not succeeded in developing her child or helped to shape his self confidence. With that in mind, she took a bold step into what she believed was worthwhile and that was the birth of heART Studio in 2012. If there is one thing that makes a key difference, it is the people. 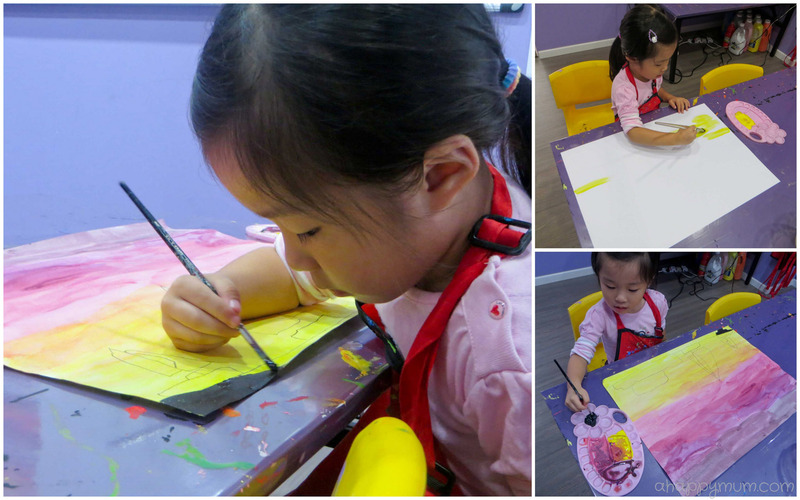 heART Studio has a team of dedicated, caring and friendly teachers who share the same passion for children and art. They are concerned with not just churning out beautiful artworks, they also believe in nurturing the creative potential of children and at the same time cultivate and inspire them. For Angel's first project in her second term at heART Studio, she was introduced to sunsets and silhouettes. Every project has a different theme and spans across a total of three to four weeks. Some parents might be puzzled over why such a long time is needed and some might prefer to see 'results' at the end of every lesson. The question is, are results measured by how many pieces of artwork your child has achieved and how beautiful they are, or are they measured by how much of it is done by his/her hands and how he/she has put in patience, time and effort into completing one final piece of work? For me, I definitely prefer the latter. I witnessed how my girl learnt to draw and paint from scratch each time and as best as she could, every stroke of the brush was her own. While she might not be the fastest learner, Teacher Syafiq catered to her needs and instead of drawing for her, he would give her simpler tasks to fulfill and never fail to provide her with encouraging words and kind guidance. I said before and I am saying it again, there should be no spoonfeeding in art if you really wish for your child to learn and benefit through it. The great thing about art is that there is no right or wrong, it is an outlet for children to express themselves, to be who they are, to feel special and create unique artwork with not just their hands, but their hearts. Ta-dah! Presenting Angel's final sunset artwork. From a selection of boats, buildings, bridges, trees and mountains, she chose to paint the silhouette of boats and I kind of attribute it to the fact that she is always proud to say that Daddy works in a submarine. While it thrills me to see beautiful art pieces like this from my girl, I am more concerned about whether the art classes have helped her to grow and whether she has enjoyed the lesson too. Well, for now, I guess that big, sparkling smile tells it all. Beautiful piece of silhuouette! U've got to display them in your home and wow your guests :) So proud of Angel! Haha thanks Angie, I wish I had more space in my house to display her pretty artworks! =) I will keep them safe for now! wow! i dun think i can even paint that! gd job Angel! v nice!! Thanks much! She had guidance, I'm sure you can do it too if you were her! I am awed, very awed by Angel's art piece. Great job! Thanks Susan! =) I love this piece too! Angel's artwork is wonderful! I wish I can paint like that. And from your posts, the structure of the class is very educational, unlike the old art classes I attended as a kid.